After leaving the tranquility of Bali we flew to Kuala Lumpur for three days and this ended up being a rather rude jolt back to reality! The long and disorderly immigration queue at Customs had us standing for close to an hour with people pushing in wherever they pleased and standing 4 or 5 deep, in what should have been a single file queue! It was quite an eye opener. An early morning walk from the Swiss-Garden Hotel to Low Yat Plaza revealed that shops and malls in KL only open at 10am! 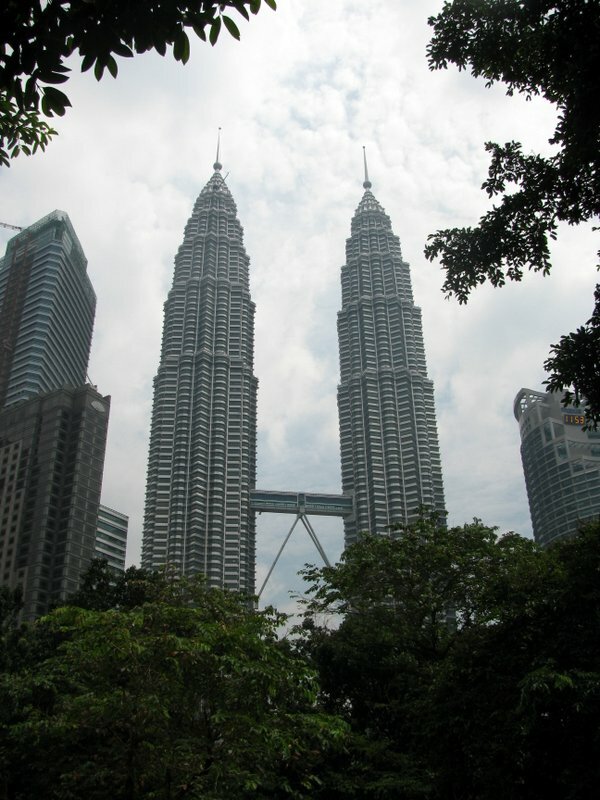 This gave us an excuse to walk to the Petronas Towers, around the Mall at KLCC (Kuala Lumpur Convention Centre) and through the surrounding Park. The queue to go up to the top of the Towers was extremely long and there was no guarantee that we’d make it to the front of the queue before the ticket office closed, so it was off to Aquaria for us instead. KLCC’s Aquaria has an amazing variety of sea life and as you walk into the aquarium there are three “touch pools” where you have a chance to touch and feel a horseshoe crab, horned sea star and harmless bamboo sharks (they feel a little like sandpaper). 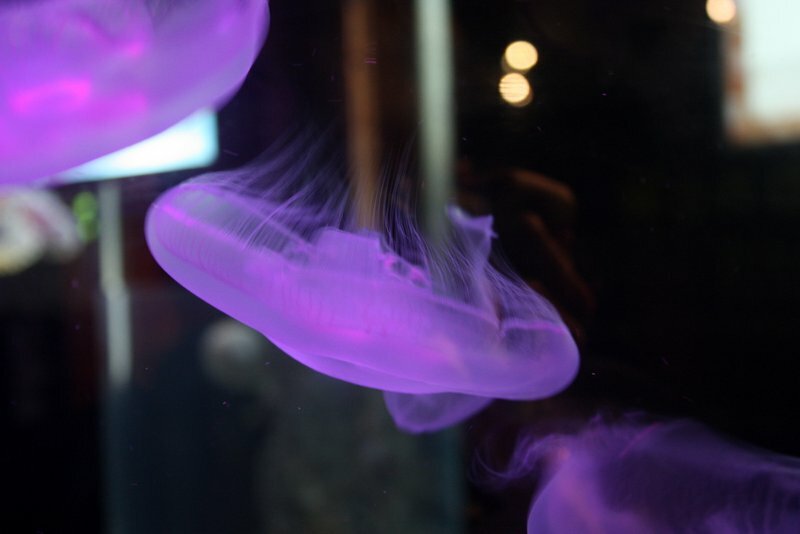 The journey through this large aquarium starts off with a sighting of an Electric Eel before you encounter “The Stream”; an area inhabited by giant water rats, Asian small-clawed otters, flesh-eating pirahas and freshwater alligator-snapping turtles. Amid a simulated jungle walk, the “Jewels of the Jungle” peer out at you from inside their glass cages; all kinds of reptiles, amphibians and insects that will give you plenty to look at, while the sleepy Coatimundi curl up lazily as you walk on by. A tube tank captivates the imagination as you descend to level 2. 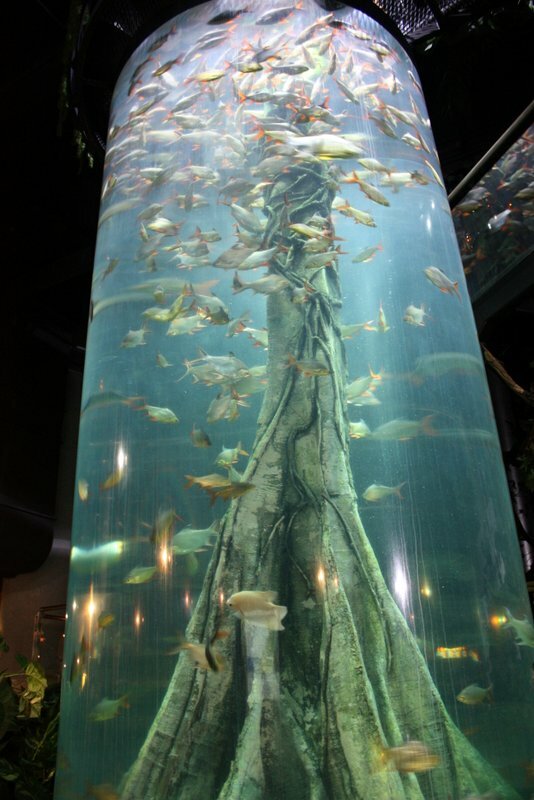 “The Deep Forest” welcomes you to level 2 with enormous Arapaima and catfish. “The Coast” gets to show off its archer fish that spit at their prey, silver bat fish, spotted rays, bamboo sharks and little porcupine fishes that seem to endlessly ‘cruise’ up and down the surface of their shallow tank. 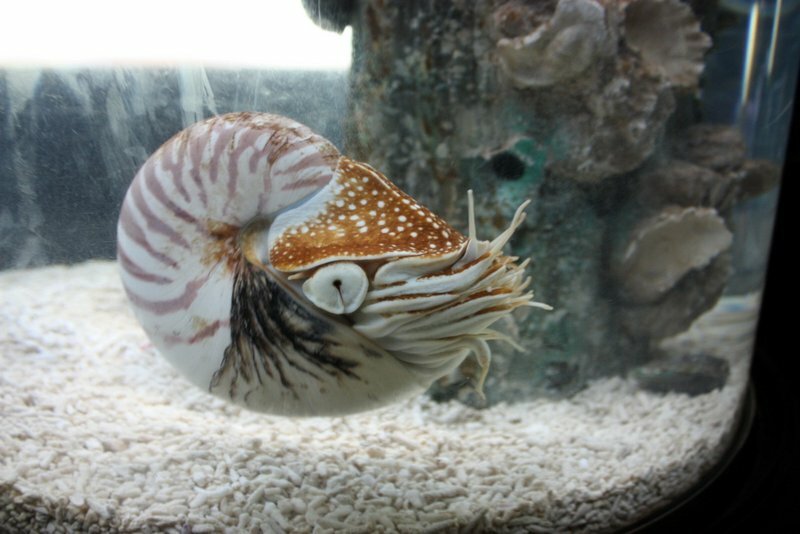 “Weird & Wonderful” reveals venomous stonefish, pinecone fishes, a chambered nautilus, shy little seahorses and bright, neon-coloured jellyfish, to name a few. 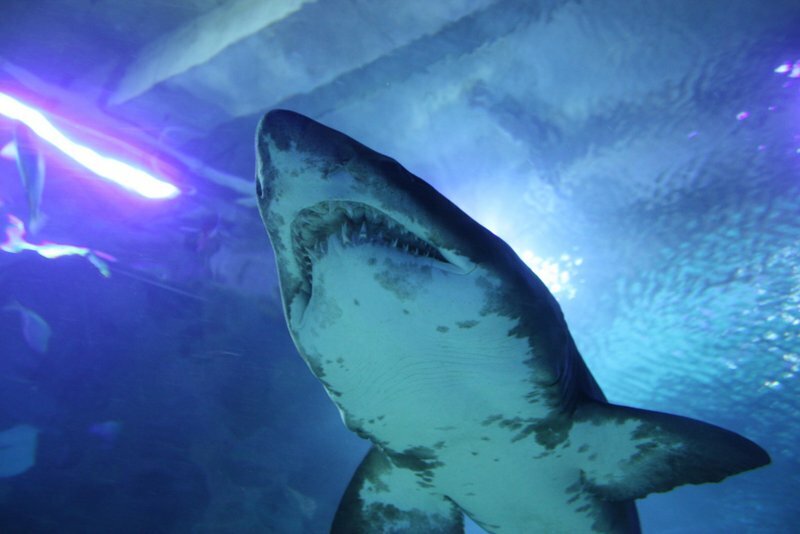 The highlight of the aquarium was an awesome 90m tunnel with a moving walkway that takes you on an effortless journey through a glass dome past tiger sharks, moray eels, giant stingrays, eagle rays, turtles and shoals of fish. It’s a mind-blowing experience, especially when you take into account the fact that the glass dome makes the fish appear 30% smaller than they are in real life! That means that some of the HUGE rays, sharks and turtles that you see in there are actually 30% bigger! It’s utterly amazing and hard to image the true size of some of these creatures. Taking photos in the tunnel proved to be an odd experience, especially on the moving walkway. If you start to feel a little dizzy, simply step off onto the fixed pathway. This pathway is there for those in wheelchairs, those with prams or others who prefer to walk. Of course, I had to go through the tunnel twice (both times on the moving walkway), as it was just so much fun and such a unique experience! 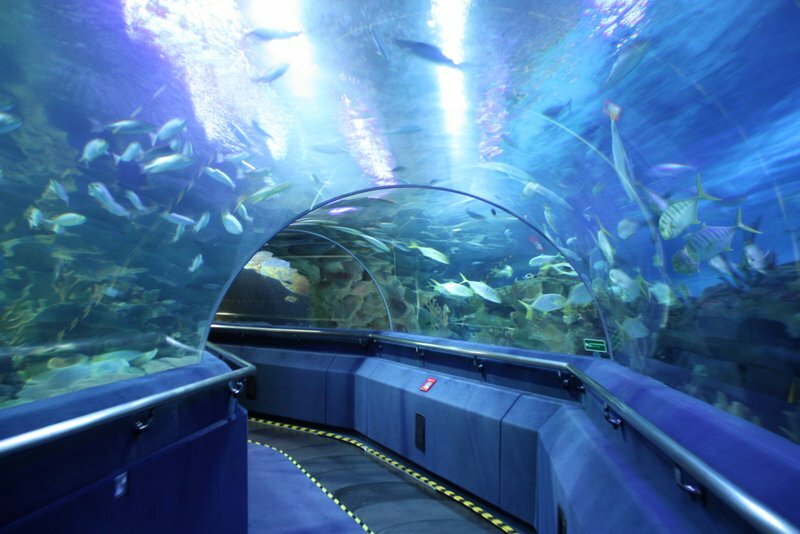 A full day could be spent at Aquaria KLCC. Just outside the tunnel are stands selling fashion accessories, caricatures, body art, rice art and other souvenirs. 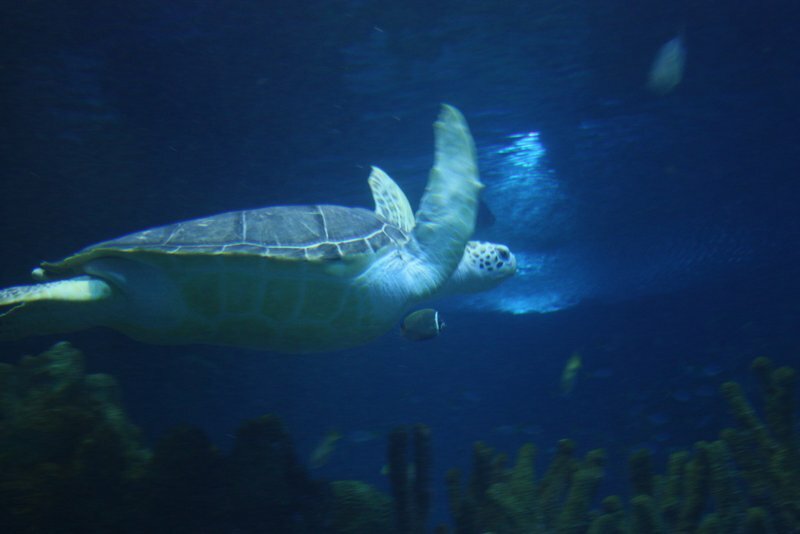 The exit to the aquarium is through the gift shop, so don’t worry if you forgot to purchase souvenirs while inside, the shop has a wide variety of mementoes in various shapes and sizes. 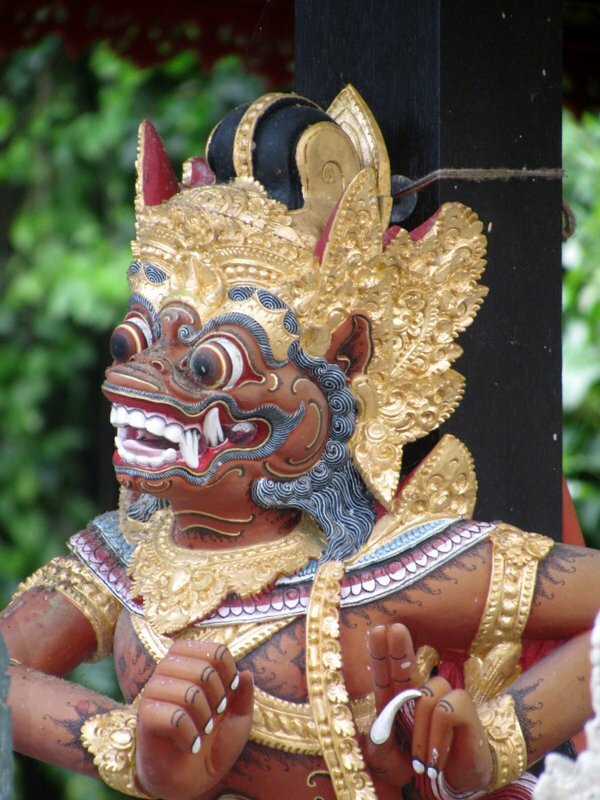 There is a unique smell that lingers in Bali and the surrounding islands and it comes from small offering baskets that the Balinese people make daily and set out three times per day. You’ll see them all over the island; on pavements, in homes and in temples. 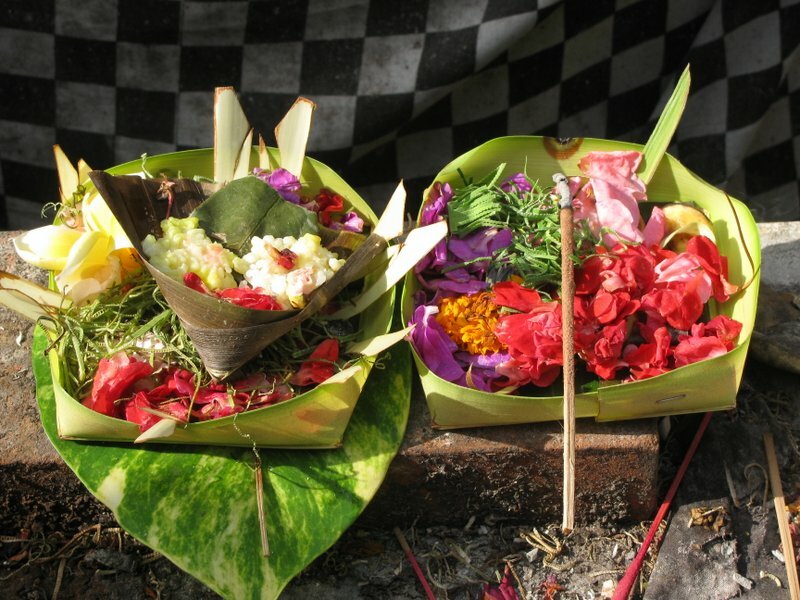 They’re made from leaves called ‘canang sari ‘ and contain rice, flowers and incense to appease the gods or spirits and hopefully bring prosperity and good health to the household. It’s a way of saying thank you and being grateful for all that you’ve been given. An organised 8-hour guided day-tour to Kintamani to see the crater and lake at Mt Batur took us on a trip across the island of Bali. Leaving at 8.30am, our first stop was a Temple in Batubulan where we observed a traditional dance known as the Barong & Keris Dance. Next on our itinerary was a stop in Celuk to see a Batik factory where cotton and silk fabrics are hand-woven on a loom and the ladies place hot wax designs directly onto fabric by hand. They hand paint the fabric before applying a layer of wax and then the next layer of paint, continuing with these wax & paint layers until a piece of artwork is finally completed. Next up was a silver factory where jewellery is hand-made, right down to the most intricate and delicate designs that I’ve ever seen. Some of the work was really elegant and minutely detailed! We left with souvenirs of our trip – a delicate pair of frangipani earrings and a piece of Balinese artwork displaying the outline of the island and decorated with traditional pictures on the inside and framed in an intricately hand-carved wooden frame. At a traditional Balinese commune we were informed that all Balinese houses are laid out in the same way, whether they are single storey or multiple storeys, they always follow the same pattern as the human body: at the top is the Temple (head); then the parents room; the teenagers have their own room, conveniently situated near the gate for evening visits, sneaking off, etc complete with a balcony for socializing; the elders platform is in the middle (heart); then the kitchen (stomach) behind which is the bathroom (bowels) and an animal pen next to that (feet or ground level). We finally reached Kintamani, a crater within a crater. Here we had a buffet lunch at the Lakeview Restaurant, which is situated inside the volcanic crater overlooking the lake inside the main crater. After this crater was formed, the volcano must have erupted a second time, as there is a volcanic peak (Mt Batur) in the centre of the original, large crater. It was quite mind blowing looking at the view and a real pity that the weather didn’t play along. There was a lot of haze and low-lying cloud which prevented us from getting any really good photos. On the trip to Patra Bali we stopped at Trisna Bali Agrotourism where we saw a variety of fruit being grown; snakeskin fruit, pineapples, durian, etc., as well as vanilla, coffee beans and cocoa. Kopi luwak (or civet coffee) is one of the world’s most expensive coffees, as the coffee berries are eaten by civets as part of their diet. Once the beans have passed through the civet’s digestive tract, the beans are then defecated and are still bean shaped. These beans are then gathered, given a thorough wash and dried in the sun before being roasted and brewed. Seeing the civets in cages on the property made this whole process much more of a reality, instead of it being something in the back of the mind. We got to taste various products, including different coffees, teas and hot chocolate all made locally and we purchased some of the coffee and chocolate to take home with us. We were supposed to stop at a Temple built in ±944AD, but had run out of time and the sun was too low for us to take photographs, so our guide offered to show us a closer Temple, being “The Temple of Holy Waters”. 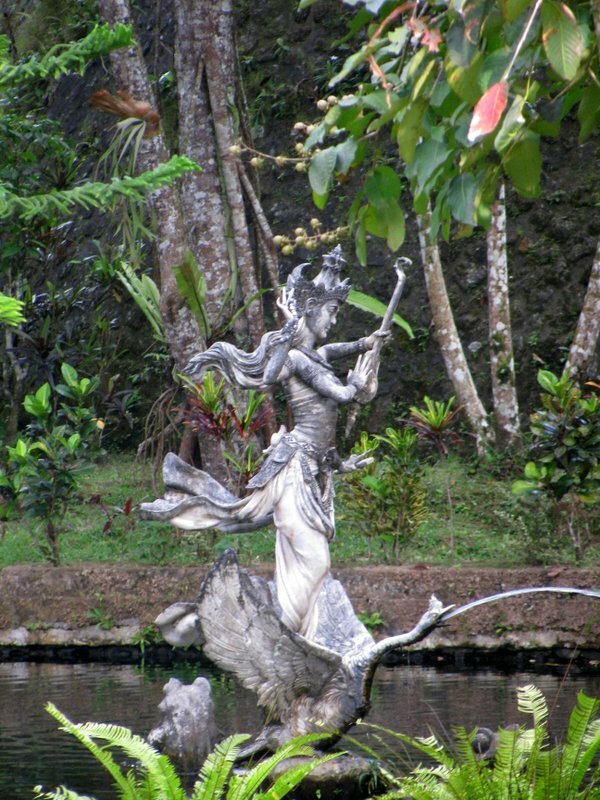 As the name suggests, this temple is situated on ground surrounded by greenery and peaceful pools of water. 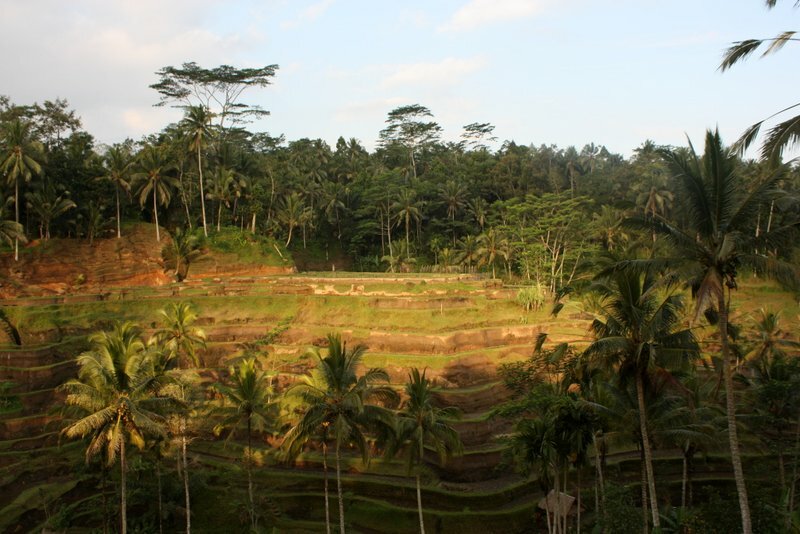 Terraced rice paddies dotted the landscape on our way back to the Patra Bali Resort. This day trip marked the end of our time in Bali. It is a truly beautiful country with warm and friendly people. An amazing place on Earth! Dreamland Beach (also known as New Kuta Beach) used to be a popular and sought after surf spot, but due to a failed development and a shift in the sand, the surf spot has changed drastically and the beach now has a very dangerous shore break. A walk across to Dreamland, in the midday heat, had us stopping in at El Kebron for some refreshment. El Kebron is a Spanish restaurant with a very relaxed atmosphere, decorated outdoors with bean bags and coffee tables spread out on the terrace, overlooking the stunning sea views. Unfortunately, we found the newly opened El Kebron to be horribly expensive, so we didn’t stay for long and definitely didn’t have a meal there. 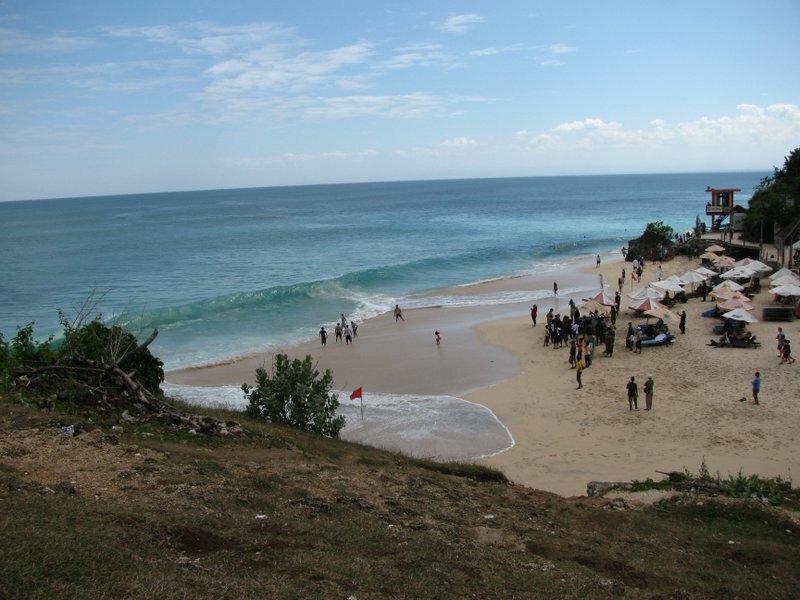 Padang-Padang is a very popular white sand beach with a famous surfing spot and it tends to get crowded very quickly. If you plan on spending the day there, go early to secure your spot in the sand! The beach is accessed via a steep, stepped pathway situated north of the traffic bridge and the steep access may be a challenge for those with small children or the elderly, so take heed of the warning signs; the steps do become slippery when there is lots of sand on them. Ablutions and change rooms are situated at the top of the stairs and there are no facilities on the beach, so if you do need to visit the loo, you’ll have to climb the stairs! A walk over to Padang-Padang from Temple Lodge ended with us having a meal at a wonderful restaurant called Yeye Warung. The food was very reasonably priced, good value for money and their delectable choc-chip banana pancakes were a real treat! Another good restaurant in the area on the way to Padang-Padang, is Buddha Soul. Their fresh, tasty fish is cooked to perfection and just falls apart on your plate, it will definitely have you going back for more. 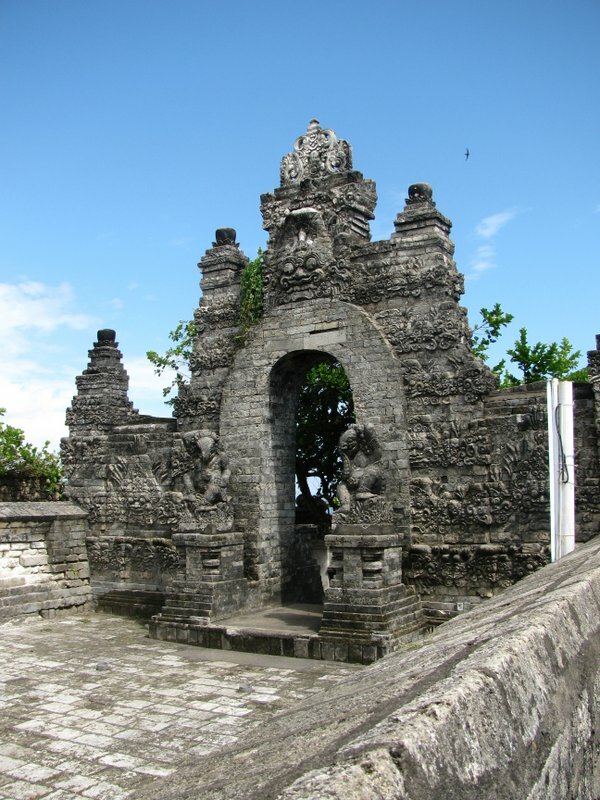 Uluwatu Temple was built in the 11th century and is one of nine directional temples meant to protect Bali from evil spirits. It is perched on the edge of a steep cliff about 70 meters above the churning, crashing sea below. 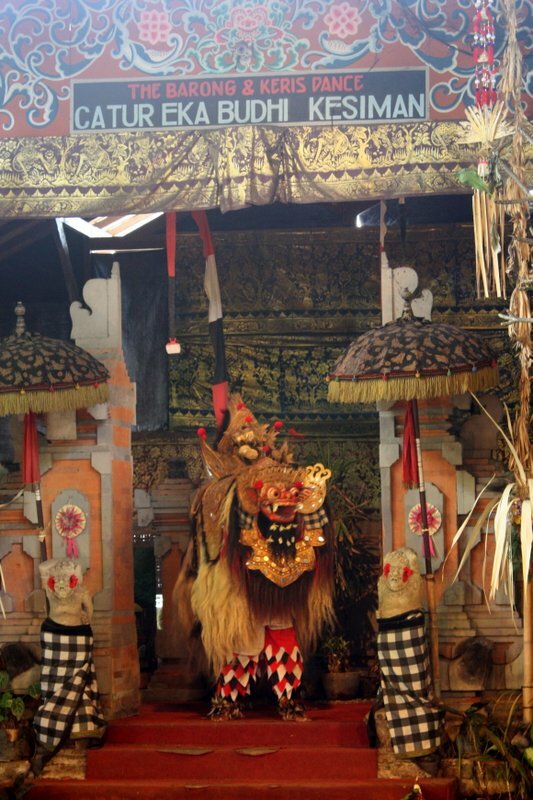 Upon paying the entrance fee, sarongs and sashes are given on loan for you to wear for the duration of the tour as you have to be respectfully dressed when entering the temple. We chose to decline the assistance of a guide to chase off monkeys which is said to be free, but beware, they do expect to be paid! Hang on to your hats, sunglasses, cameras and any other loose items, as the resident monkeys will grab any opportunity to take whatever belongings they can and make off into the bush with them. If you do happen to have something snatched, you can try and get the item back by trading with the monkey for a piece of fruit, but rather be safe than sorry. I have never in my life seen such overweight monkeys! Tourists are encouraged to buy bags of fruit to feed them and some of the poor things were so overweight that when they sat down there was a large roll of fat that gathered above their tails! It was a very odd and sad sight to see. We were free to walk around the grounds and take photos, but certain areas of the temple were cordoned off as these are only entered during times when special rituals are performed. 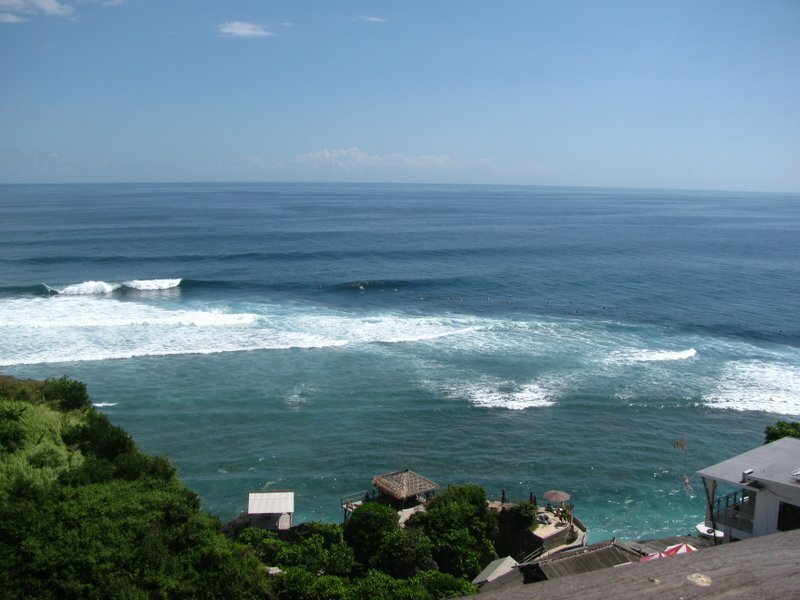 Uluwatu beach has a popular surf break that is frequented by local and international surfers alike. We stopped at one of the restaurants overlooking the sea for lunch and at one stage I counted about 52 surfers in the water, all competing to catch a wave. 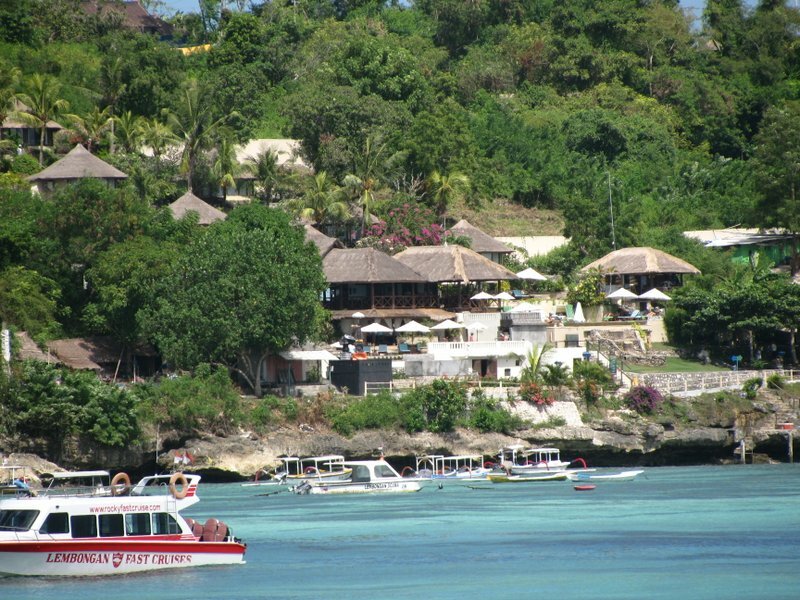 The Lembongan Flyer is a large speed-boat that transferred us from Nusa Lembongan back to the main island of Bali. We were met at the drop-off point by our transfer and taken across to Temple Lodge. 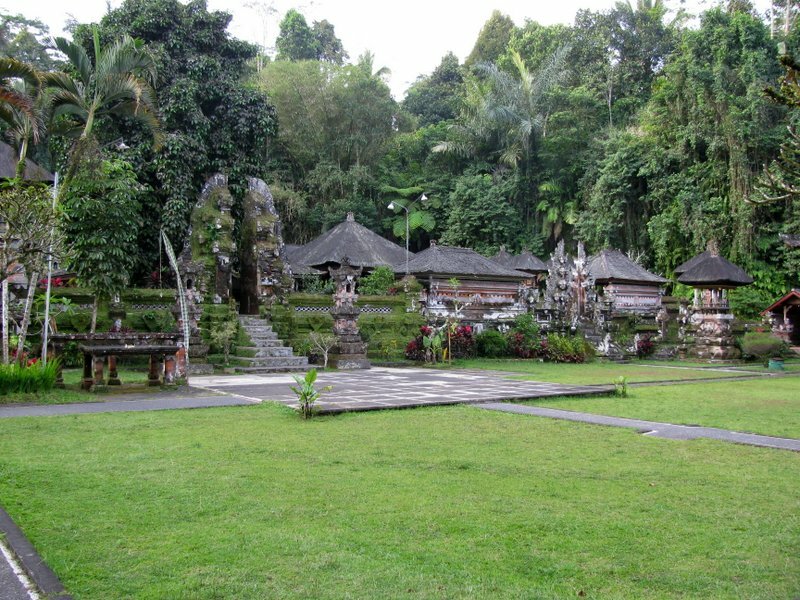 Temple Lodge is situated high on top of the cliffs on the Bukit peninsula and the Lodge has spectacular views looking out over Impossibles surf break, Bingin and Dreamland. 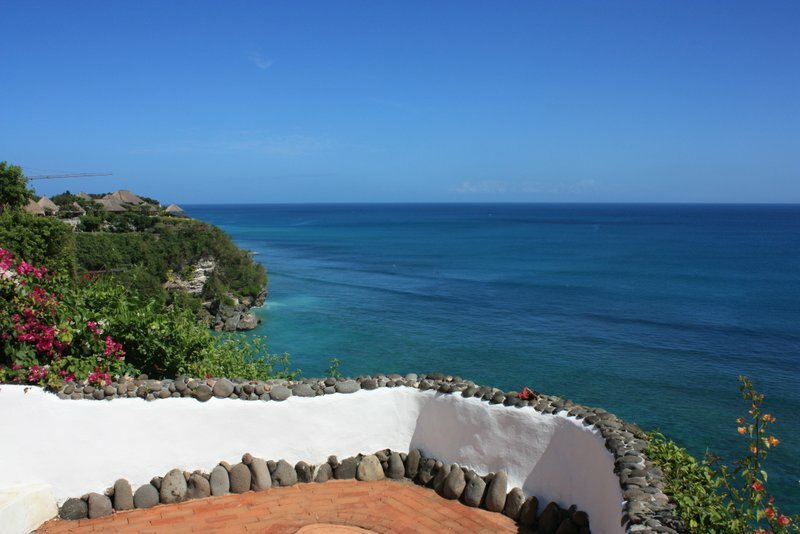 We’d booked the Coral Suite (the Honeymoon Suite), which is completely open plan and literally carved out of the side of the cliff. Walking into the suite, the bedroom is directly in front of you with a few stairs to the left that takes you down onto a private cushioned balcony. If you go up the little staircase, you’ll end up in a very unique bathroom; the loo has a view over the whole suite and looks out through balcony window out to sea! It took a little getting used to, but was an experience that will remain with us forever. Meals at the restaurant on site consist of a pre-set menu that changes daily, with extremely generous portions. Mouth-watering starters such as spaghetti with feta, courgettes and tomatoes; scrumptious mains like salad with roasted peppers and fish & prawns or fish skewers with roasted pumpkin and baby spinach salad were just a few that we experienced. Most of the vegetables used here are home grown and their to-die-for desserts like Apple Crumble and Chocolate Brownies are all homemade. The relaxed, homely atmosphere in the restaurant is amplified by the fact that everyone sits and eats at one large main table and the chatter among hosts and guests while a meal is shared, gives you the feeling of being a part this wonderful family, even if it is only for a few days. 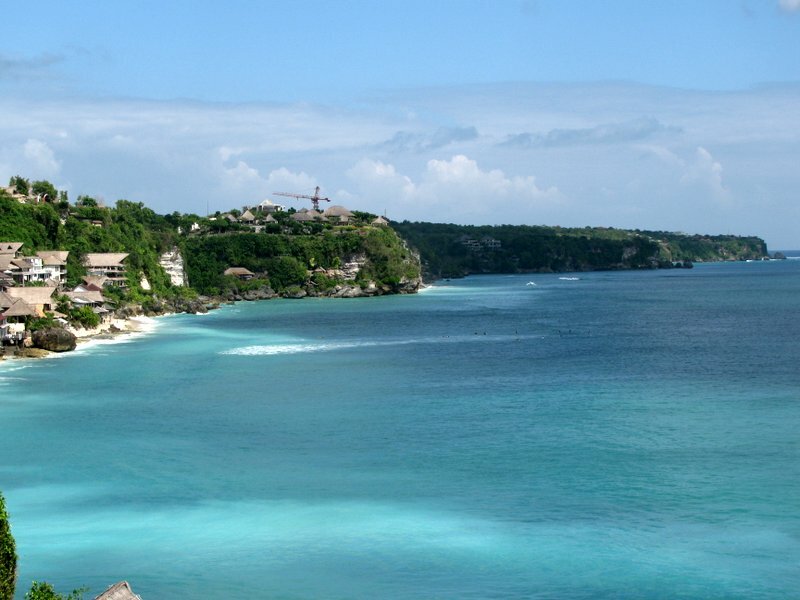 Walking around Nusa Lembongan is very peaceful and pleasant. The coastal paths and roads make walking around very easy, there’s lots to see and there are no hawkers around to constantly hassle you. We decided to go exploring and walked from Coconuts Beach Resort to Mangrove Point and on the way back, had a delightful lunch at Nyoman’s Warung. We’d done a bit of research before arriving in Bali and many sites on the internet (including TripAdvisor) had advised stopping here for a meal. Relaxing at one of the little outside tables in the island breeze, while sipping on an ice cold Bintang and looking out over the white sandy beach, watching the seaweed farmers at work, is what being in paradise is all about! 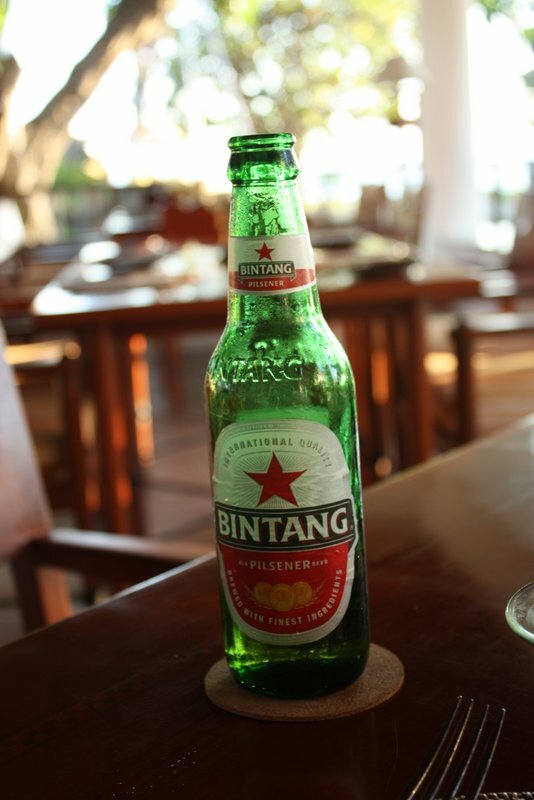 The Bintang’s that Nyoman served were the coldest we’d ever had! They were just short of being frozen and were extremely refreshing after the long walk under the hot Balinese sun. Nyoman is a wonderful hostess, the food is great value for money and we ate far too much! Her crisp and tasty homemade spring rolls do come highly recommended and a meal at Nyoman’s Warung is definitely something not to be missed!